There’s a lot of buzz about how new education platforms are making it easy to acquire the kind of skills that, traditionally, have been reserved for the hallowed halls of higher education. These services, whether it be Khan Academy or one of the countless new MOOCs or MOOC hybrids, want to make it easy for students young and old not only to learn but also to get hired. 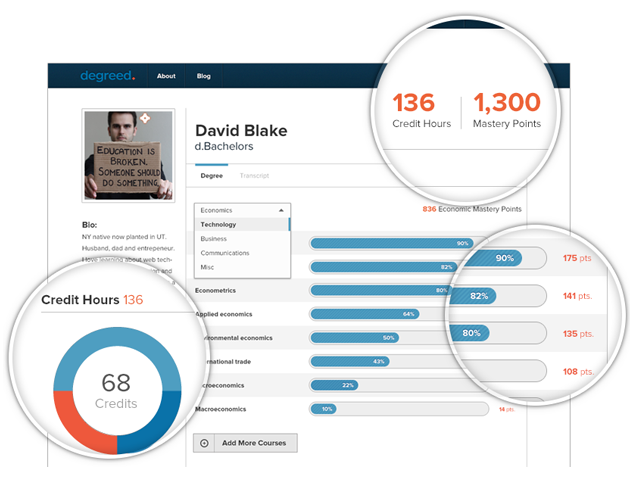 One new San Francisco startup, Degreed, is on a mission to “jailbreak the degree” and give learners a new form of academic credentialing. The startup’s free service essentially scores and validates a host of different learning inputs, whether they be from formal institutions, like the University of California, or informal platforms like Khan, Lynda.com, iTunesU, Coursera and so on. The startup recently came into a $100K grant from the Gates and MacArthur Foundations after winning the “Digital Media and Learning Competition.” Now the company is looking to raise another $100K to help get off the ground and create what it hopes will be a “lifelong diploma-granting” platform. Rather than go straight for the traditional venture capital route (although this is an option down the road), the startup decided to host its own fundraising campaign, Kickstarter-style, right on its homepage. As of today, the company has already brought in over $22K. The motivation for this, says Degreed Founder and CEO David Blake, is that, while college remains an endearingly positive personal experience, the four-year degree is still inefficient. The problem is that there are too many people who either don’t finish their formal training and their learning is discounted as a result — or for those who do finish and just get lumped in with thousands of other graduates. Really, the system is set up right now so that, as soon as you graduate, your learning doesn’t matter anymore, he says. The reason for this is that, to date, it’s extremely difficult to track, quantify and contextualize the diversity of experiences in informal lifelong learning. To do that, Degreed doesn’t want to compete with Stanford and other universities, it wants to be a complementary service where you can detail your experience in formal education (whether you have a diploma or you’re a drop out), along with the other learning activities you’ve participated in along the way. Degreed is still in the process of developing its credentialing solution and trying to work out which are the most-used informal platforms and what users want to see most. For now, they’re focusing on raising that $100K on their website, before opening up their platform more broadly to the general public early next year. The founding team already has some educational experience under its belt, as Blake was on the founding team at Zinch, a startup that sold to Chegg, and his co-founder, David Wiley, is a professor at BYU and a former entrepreneur himself. As Smarterer, LearningJar, and the coming of next-gen collegiate experiences like Minerva, there’s plenty of need to develop new ways to measure how and what we’re learning so that employers and institutions can get a better understanding of what we actually know. There are more and more who are willing to expand their definition of learning and assessment, and if Degreed can really create what it hopes will be a “FICO score” for education, then there’s reason to think that these guys will be around for awhile. The cost of a college diploma is seemingly unsustainable and student debt has crossed the trillion-dollar threshold, but formal education still has a vice grip on accreditation and assessment. Degreed has started down this road by offering “mastery points” for each subject based on classes you took at formal and informal institutions and how well you did. Of course, while it’s a good start, it remains to be seen whether or not these kind of numeric systems can really become valid currency. Sure, Degreed may show you have a 10K-point mastery score in engineering, but so what? It can’t just be the Klout score of education. Degreed is still early in its development, but it, along with others like Smarterer, are starting to ask the right questions. Even if Degreed isn’t the one to answer them, it’s a necessary part of the evolution that someone is. Find Degreed at home here.